Geographical distribution All the major metropolitian cities like Mumbai, Delhi, Chennai, Banglore, Hyderabad, Pune. Output per annum According to approximations, the total market in India is calculated to be about Rs 20,000 crore. 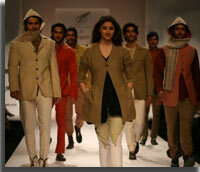 Indian Fashion Industry is at its infancy at the moment and has great potential to make the mark on the world stage. Fashion in India has thousands of years of tradition behind it. India has a rich and varied textile heritage where each region of India has its own native dress and traditional costumes. Fashion Industry is growing at a rapid pace with international developments, such as the India Fashion Week gaining popularity and annual shows by fashion designers held in major cities of India. In Indian culture, the body is invested with various meanings and reflected in its rich sculptural tradition decorating the body is yet another way of conveying meaning and personality. In Indian history, the kinds of costumes and accessories worn can be seen to fulfil two criteria: simplicity and opulence. In either of the instances, the choice of clothing is dependent on the person's status, wealth and religious orientation. In ancient India the information about fashion is available from the sculptures as very few examples of costumes, textiles and jewelery have survived. In the Indus Valley Civilization (c. 3000-1500 BC), clothing tended to be simple where men wore loin-clothes while women were bare to the waist. Their Status was reflected in the kind of jewelery they wore; high-ranking women sometimes covered their bosoms themselves with jewels. It was because of Aryans that India had more complicated clothing consisting of the upper and lower garments was introduced, to which a cloak was added later. Generally pieces of cloth draped over the body in a style seen in many Indian costumes today. Indian Dhoti, the Scarf or Utterly, and the popular Turban are still visible and continue to be part of Indian fashion. After the independence, Indian Fashion industry witnessed the effects of globalization. Due to this, changes occurred in the dressing style of Indians, which even led to the fusion of Indian and western dresses. Wearing kurtis on jeans, spaghetti with sarees are the examples showing the effect of western culture on Indian. The work of Indian designers is highly appreciated all over the world. Western brands are also coming to participate in Indian fashion weeks, as they see a lot of potential in our market. Fashion in India is a fastly growing industry with international events such as the India Fashion Week and annual shows by fashion designers in the major cities of the country There are victories of a number of Indian beauty queens in International events such as Miss World and Miss Universe contests which have made Indian models recognized worldwide. Fashion designers such as Ritu Kumar, Ritu Beri, Rina Dhaka, Rohit Bal, Muzaffar Ali, Satya Paul, Abraham and Thakore, Tarun Tahiliani, JJ Valaya and Manish Malhotra are some of the well known fashion designers in India. India Fashion Industry covers a whole range of clothing from ornate clothes designed for wedding ceremonies to prét lines, sports and casual wear. It even includes the traditional Indian techniques of embroidery like chikhan, crewel and zardosi. These traditional weaves and fabrics are used by Indian designers to create Indo-western clothing in a fusion of the best of East and West. sarees are woven in silk, cotton and artificial fibres. Kanjivaram, Mysore, Paithani, Pochampalli, Jamdani, Balucheri, Benarasi, Sambalpuri, Bandhini are some varieties of beautiful sarees from different regions of India. In Rajasthan and Gujarat men wrap and twist a length of cloth in the form of a dhoti around their lower limbs and a shirt-like kurta. Colorful turbans complete the picture of theIndian people. In urban India, the women commonly wear salwar kameez and the churidar kameez, is worn by women who go to work and the saree is worn on formal occasions. Men wear kurtas and pajamas, or a sherwani for formal wear. Western wear such as shirts and trousers are commonly worn by men across India. Jeans, T-shirts, capris, bermudas are the kind of casual clothing worn by the young and the young at heart, who are the trendsetters of fashion in India. Since the last decade the Indian fashion industry has moved from the embryonic stage to a blossoming take-off. Fashion designers have contributed immensely to the spread of fashion as a driving force, both among Indian consumers and select segments of Western markets. India can now boast of dozens of leading fashion designers, who can match any European fashion designer in their concepts, styles and designs. Ritu Beri, Rohit Bal, Ritu Kumar, Abraham and Thakore, Deepika Govind, Gitanjali Kashyap, Indira Broker, J.J.Valaya, Lina Tipnis, Manoviraj Khosla, Pavan Aswani, Payal Jain, Ravi Bajaj, Rina Dhaka, Sharon Leong and Chandrajit Adhikari, Shaina NC, Sonali and Himanshu, Wendell Rodricks, Anna Singh, Ashish Soni, Jatin Kochar, Madhu Jain, Manish Malhotra, Ravi Bajaj, Salim Asgarally and Tarun Tahlliani top the growing list of reputed fashion designers in India. A report on Indian Fashion Industry recently stated that this Industry can increase from its net worth of Rs 200 crore to Rs 1,000 crore in the next five to ten years. Currently, the worldwide market for designer wear is amounted at $35 billion, with a 9% growth rate, with the Indian fashion industry creating hardly 0.1% of the international industry's net worth. According to approximations, the total market in India is calculated to be about Rs 20,000 crore. The branded Fashion market's size is nearly one fourth of this or Rs 5,000 crore. Designer wear, in turn, covers nearly about 0.2 % of the branded apparel market. Today the largest sales turnover within the designer wear segment is about Rs 25 crore, with other well-known names having less turnovers of Rs10-15 crore. In an analysis of ASSOCHAM on "Indian Fashion Industry", it was further revealed that the Indian fashion industry accounts for barely 0.2 % of the international industry's net worth. Currently the market for designer wear is worth about Rs 1,62,900 crore and growing at 9.5 % every year. As per the estimates, Indian designer wear commands a category engagement of 66 % for male customers and 57 % for female customers. The category engagement in western designer wear is 5%. The per capita per annum on designer wear for men amounts up to Rs 48,627 and Rs 56,271 for women. India Fashion Industry is a very big exporter of Fabrics and accessories for the global fashion industry. Indian ethnic designs are considered as a significant facet for the fashion houses and garment manufacturers all over the world. India also plays a vital role as one of the biggest players in the international fashion arena for fabrics, while sourcing for fashion wear. India's strengths are due to its tradition, but even its raw materials. India is the third largest producer of cotton, the second largest producer of silk and the fifth largest producer of man-made fibers all over the world. There has been growing consciousness among the Indian men and women towards the fashion, styles and designs of the dresses since long times. There are several institutes like National Institute of Fashion Technology (NIFT), Indian Institute of Fashion Technology (IIFT) and other fashion academies which have been established where the students are taught to translate their creativity into dresses and fabric designs. The media has also played an important role in the fashion boom by providing good coverage to the fashion world and even several magazines are specifically devoted only to the fashion scene. The proliferation of fashion-based programmers on the satellite television channels has increased the consciousness of the average Indian masses about the changing trends in the global fashion. This industry is also generating a lot of business and becoming a booming industry for generating a lot of jobs for people. More and more fashion training institutes and fashion corporations are cropping up. Many national and international brands are establishing themselves in Indian market. The mall culture has immensely helped in the growth of our fashion industry. Thus, globalization has completely changed the face of our Indian fashion industry. Today the fashion designers and management experts foresee an average growth of about 10-12 % for the Indian fashion industry in the coming years. Though, the growth rate could be more than 15%, if infrastructural and other logistical bottlenecks and drawbacks are over come, Indian fashion design industry is expected to grow much faster than projected (Rs. 500 cr.) and likely to touch Rs.750 cr. by 2012 from the current level of Rs.270 cr. because Indian companies are heavily investing big sums in the industry, consumers are increasingly shifting focus towards designer wear, exposure to western media and readily available of designer wear in the shopping malls, according to The Associated Chambers of Commerce and Industry (ASSOCHAM).